Amazing colors! It's great to be surprised like that abaout the city you were born, raised and live!!! cool, really like the colors! VERY BRAZILIAN LIFESTYLE, ISN'T IT? DON'T FORGET TO PHOTOGRAPH THE MAIN BRAZILIAN BRANDS STORES, LIKE OSKLEN, ALEXANDRE HERCHOVITCH, COLCCI..
How gorgeous! The texture and color patterns, the way the graffiti mimics the old fan leading the eye toward the other old retail objects within. The barber's yellow smock! All that blue and aqua, the customer's crew socks. Love this, thank you! Thinking honneymoon 2011..show me more!!! Luscious colors and lighting. Love the turquoise barber's chair and how the doors frame the photo. spectacular photo! i love the blue of the chairs..
Wow! What a great photograph. The color contrast is amazing. I love the colors! That baby blue and the chocolate leather on those chairs are amazing. I see some serious decorating possibilities with those blue barber chairs! Those chairs must be really old. I've seen similar red chairs in an old barber shop on a small Greek island. The chair, the mosaic on the floor…on the opposite side of the world but not too far apparently. Fascinating. All these colours and such stillness… Beautiful! Its amazing how you can take something as simple as a guy getting a shave look totally interesting. I am disquieted by this photo. Although the customer strikes a relaxed pose, there is some inherent tension in the way the two men interact. And the scene: clean, but somehow dirty; small, but somehow cavernous. The striplights are evocative of a clinical operation, but they cast a cold light on what was undoubtedly a warm scene. Excellently caputred shot. By the way im Mexican and i think you would just love the colors over here. Hope you can come one day. AHHHHHHHH!!!! I want those blue chairs in my house!!! This is exactly what I imagine Rio to be like. Is this supposed to be any kind of fashion ? If it is, I'm totally wrong about the subject. awesome street shot….old school male grooming, we have a similar one in my neighbourhood – for an extra $5.00 he gives the boys a steam facial using hot towels! I have pleaded with my hair stylist to get a chair and a barber. I would use them every time I come in. If you have never done this you must. It is a magnificent luxury. How nice! Everyone's right, the colors are amazing…wonderful how they're so plentiful there!! this is absolutely beautiful. most westerners would probably never want to step foot in a shop that looks like that, but it just looks so warm with the turquoise, chocolate brown, peridot green and bright white towels. a kind of faded elegance. thank you sart. Adoro a maneira como captas a essência das cores! –> I love the way how you always manage to capture the essence of the colours! Were you in the japanese part of the town? That's beautiful! Love the colors. It's nice to look at in the middle of a dull gray NYC winter. The colors of those chairs are divine! Perfect! love the turquoise chair, awesome! lekisskiss.blogspot.com <– 2 girls bloggin fashion in nyc and chicago! Oh my, I am in love with the blues in this picture!! The interior of that place is perfect. Love all the texture. Beautiful photo. One of the many reasons why I love Brazil. What a great place. Great photo. Love the typeface on the clock, the fan on the shelf and, of course, the color of the chairs. One of my favourites! I want to know more about that crazy florescent-bulb chandelier- It is amazing! The color in this photo is amazing. Turquoise & red =one of my favorite color combos. What a difference from the barbers in Italy caught in the book, right? Is nice the way the two different pictures tell their story visually. freat photo!, beautiful colors, good composition! Absolutely beautiful. Look how relaxed he is! this picture is so amazingly taken. i like how this blog has turned into more than a fashion/ street style blog! This is one (of many) reasons Brazil is my next stop in my travels. They aren't afraid of bold colours, or boldness in living life in general. When I lived in Bondi, my Brazillian housemate wore a skimpy zebra-print bikini with lime trim without fear. I (Melbournian, afflicted with a love of black and grey) wouldn't even contemplate wearing such a garment, but she pulled it off. Her confidence made what would look trashy on anyone else look beautiful and almost elegant. This is such a beautiful shot! The chair is such a cool color and the details really bring it to be a great focus in the photo! voce encuentra belleza in oposite places. This is Latin America, hi fashion people how knows more about calvin than the reality in the favelas and the down town. I love the color of the Chairs!Very nice! It reminds me of El Salvador, where my family's from, around the corner from my grandma's house. Nostalgia wave comin through! This makes me wanna go back. The color in this photograph is soo great. I really love this. Is it bad to think Sweeney Todd? love those old barbershop chairs and miss the Russian boy who used to cut my hair at the babershop on St.Mark's Square in the E. Village; I'd go in scruffy and come out yummy! This reminds me so much of my friend's photos from Havana! Lovely! Haha! I love the barber shop. It's sad, when I was in America, I was desperately looking for such a place. I never shave at home, always at the barbers, and best of all I do it for a dollar here in India, and they do a darn good job of it. What a brilliant shot! The place, the colours, the lamp, the barber's chair…incredible! You and Garance are making me very homesick! You changed your point of view ?! i want to be in rio right now. great photo for an old job! WILL YOU GO WITH ME??? THANK YOU FOR MAKING FEEL LIKE THIS..
Beautiful shot and a welcome return to your best form! Loving the objects on the picture! 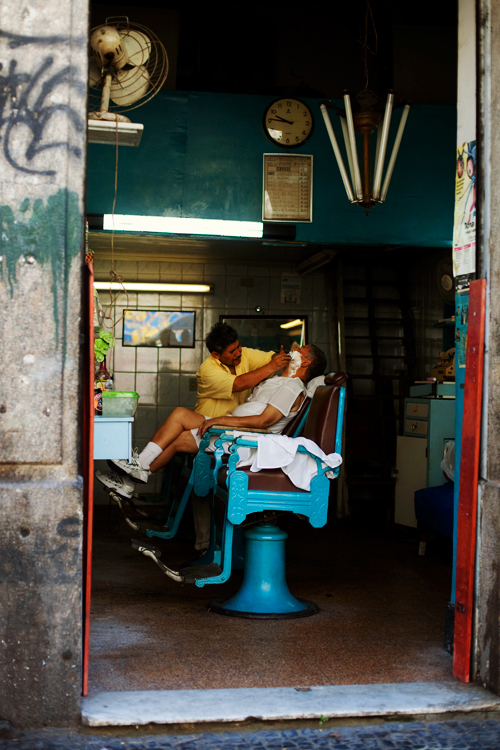 It is like a total another world, the colours and in fact that there is a barber. So enchanting. I am OBSESSED with this barber shop. The clock, the light, the fan, the CHAIRS… I wish more authentic places like this still existed in the U.S. I guess I'll just have to make a trip to Rio! I'm from Brazil and this photo is sooo great! Your blog is the best, thanks for post photos from my country! It is telling a story within a beautiful frame! love! First thing popping up in my mind when I saw this picture: "Oh god, I want those chairs!" Absolutely love their old fashioned look and then they are painted in the brightest most happy color ever! Your photography is so vivid and beautiful. I totally want that light/fan looking thing in my office. The chandelier with the fluorescent tubes is freaking spectacular! o barbeiro é super fashion… brasil arraza! amazing. the colors, the composition, the subject… i love how the man in the chair in running shoes and white socks, even with a slight paunch, but is taking care enough to get a barber's shave. awesome. this is a wonderful image. i love the color of the chair. i so badly want that light hanging from the ceiling for my apartment! its so cool. love red and turquoise together. Authentic and well lit. It looks like film. it's great to discover something new about the city i've been living for the past 31 years!!! amazing picture, great colors! congrats! a picture is worth a thousand words…especially this one. My eyes were roaming all over this gorgeous story-telling photograph. So much detail everywhere you look — from the old fan, the unusual exposed fluorescent light fixture, the amazing blue of the barber chair, the richer teal hues on the walls, the grafitti on the outer wall, the cracked blue tile at the front of the barbershop…the reds on the wood panels…..even the reflection from the mirror is a trippy visual. Thank you! Love this one, Scott! xoxo from Hot Rio. you and garance made it to me! Seeing this made me smile this morning. I have a habit of taking photos of any old barbershops I come across, and this one is a true gem! Love the framing, too. This photo made so grateful. All the other pictures from Rio are great, but this is the only one that made me say `this is Brazil`. It was very nice to see photos aside the Rio fashion scene and people, thank you so much. Absolutely taken by this picture. Thank you. It reminds me of a brighter, friendlier version of Sweeney Todd. It's beautiful. Good job. Showing the ordinary as something beautiful, this picture has made me smile. I LOVE HOW THE BEAUTIFUL COLORS BLEND SO WELL TOGETHER. THIS BARBER SHOP LOOKS MORE INVITING THAN THE REGULAR 'MODERN' BARBER SHOPS YOU NORMALLY SEE. aaah i love how the barber is holding a razor to the mans neck and hes just nonchalantly sitting there cross-legged. Reminds me of India. The colour. Dilapidated buildings buzzing with energy. Great shot. 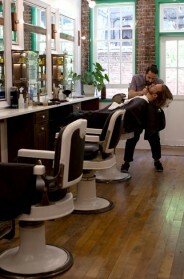 What a delightful photo with the old fashioned barber chairs. I don't see chairs like that anymore. Very vintage. Great Pictures! This picture reminds me with my father. Gosh! What a perfect picture. I remember the days! Love the photo and the concept! The colors are bright! Great picture! Which is more important…the barber shop or the barber?